Still heading west and trying to catch points of interest in California. First thing we have learned is that California is a huge state with many, many points of interest. The second thing we learned was that we have to manage our time and destinations according to the weather. 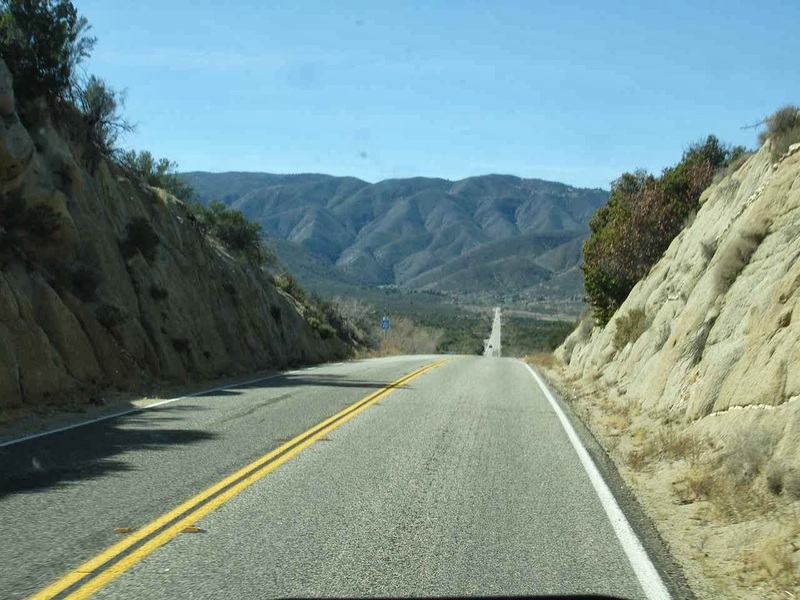 There are many high mountain ranges , even in Southern California., and it is still winter. But, Eustis is up to the challenge!! 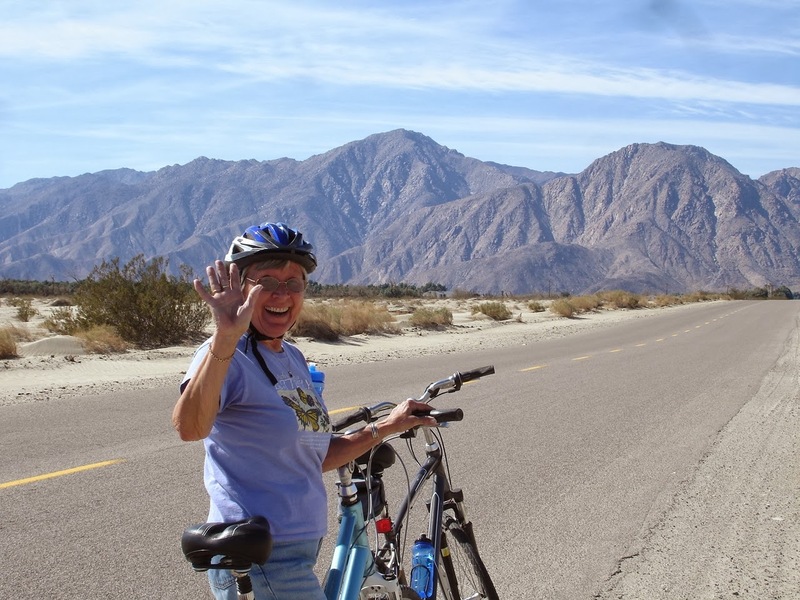 Up from the desert floor of Borrego Springs to Jojoba Hills Escapee park in Aguanga, Ca, elevation about 2,000 feet. The road to Aguanga is over some twisty mountain roads. Population is mostly Big Horn sheep. 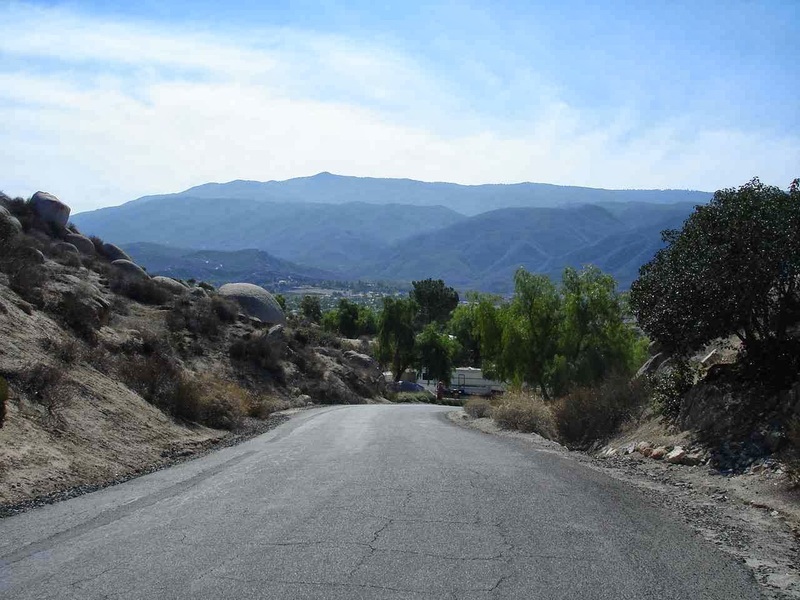 Jojoba Hills is considered by many to be the nicest Escapee park of all. Our tour with Joe certainly underscores that evaluation. The park was built by Escapee volunteers in the early 90's. A 25 year anniversary is scheduled for next February. The park was built on a hill on 148 acres and we are very impressed by the engineering mindset that planned the infrastructure for this wonder. Everything was overplanned, in the sense of huge drainage pipes, backup water tanks, buried cables, and on. 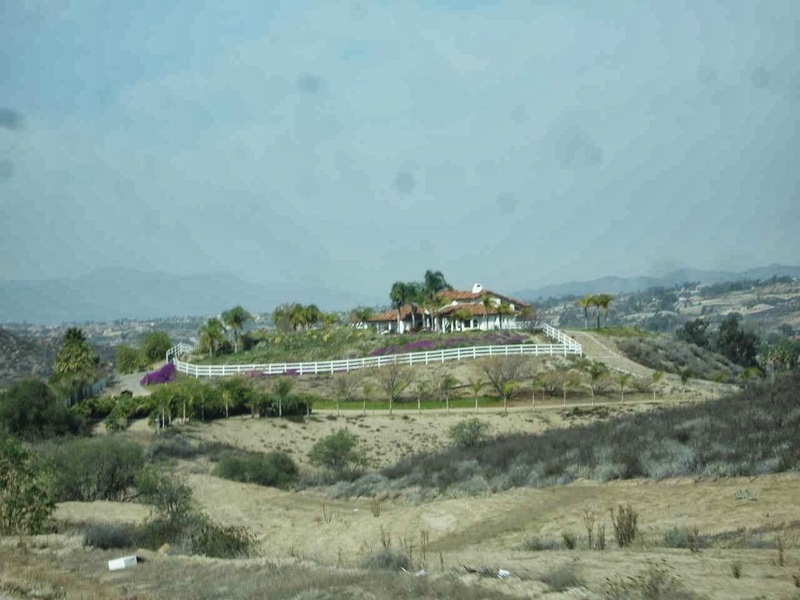 To match California tax codes, there are only 2 units per acre. Even nicer, the hill allows for a feeling of terracing, enabling most units to have wonderful views of the surrounding mountains. 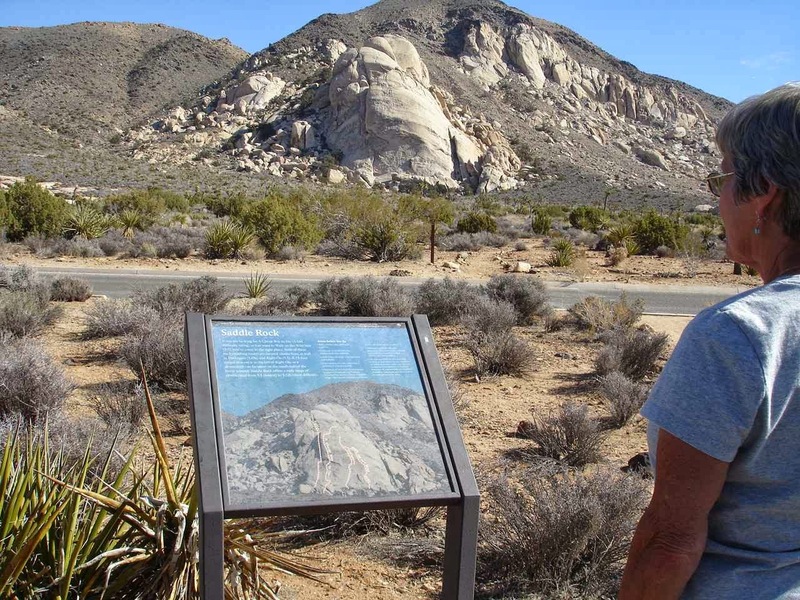 For those who know California, the park is only about 14 miles east of Temecula. There are still some original members in the park who proudly show off the work they did. 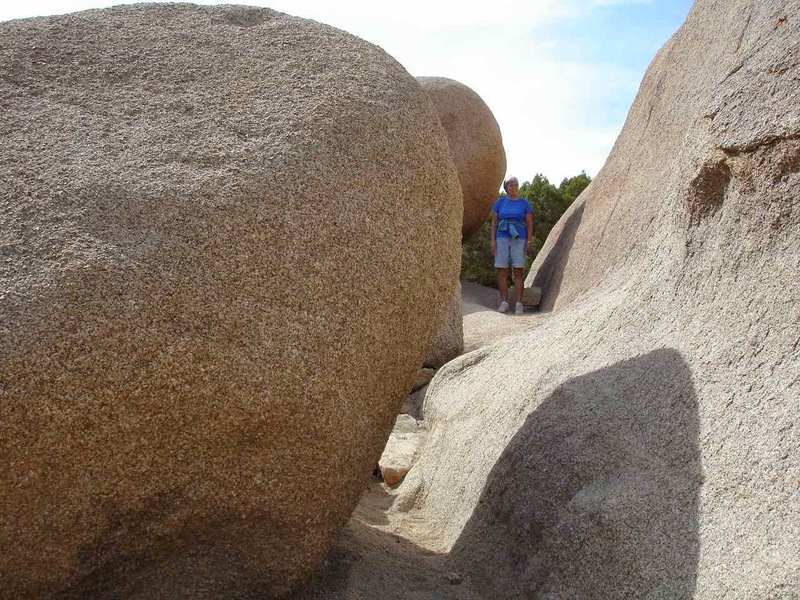 A group of women worked with rock formations ( the Rockettes). There are numerous comittees to maintain the park and it all seems to work very well. 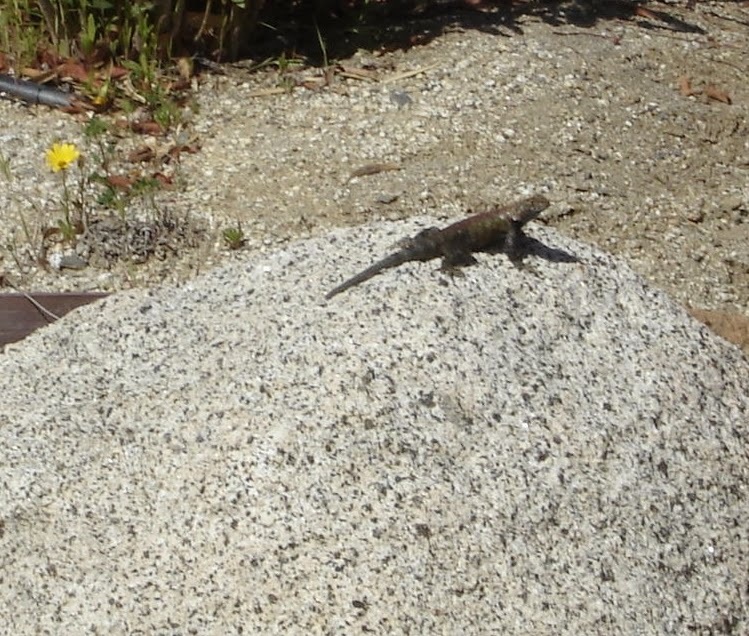 A happy lizard by the pool. There are six ponds in the park, the main purpose to contain any flooding. But they all are well taken care of with plantings and ducks. With the drought in California, it was interesting to note that Jojoba has its own wells that are still filling well from a good independent aquifer. 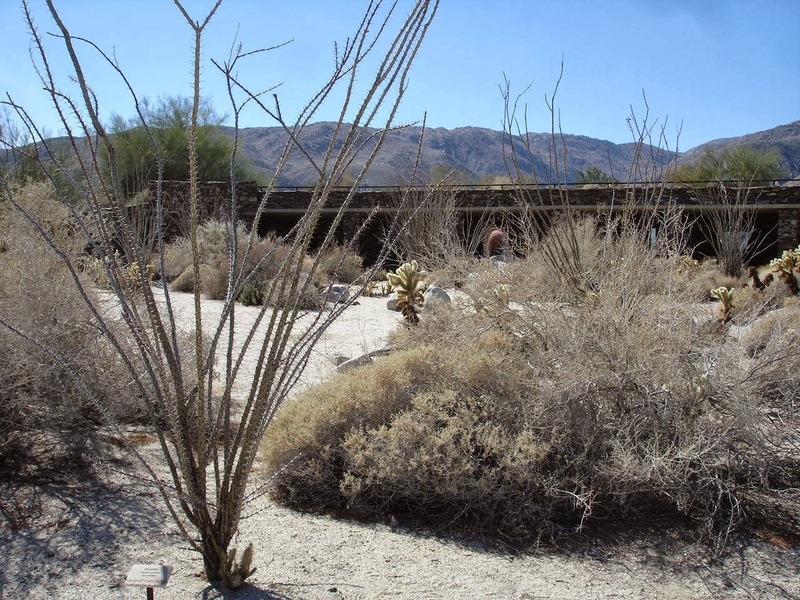 While there are some plantings that require a bit of water, most of the plantings are now native species, requiring very little watering. All of these plantings are helped by a system of drip hoses. There are all kinds of resources for members. This is a part of the library. 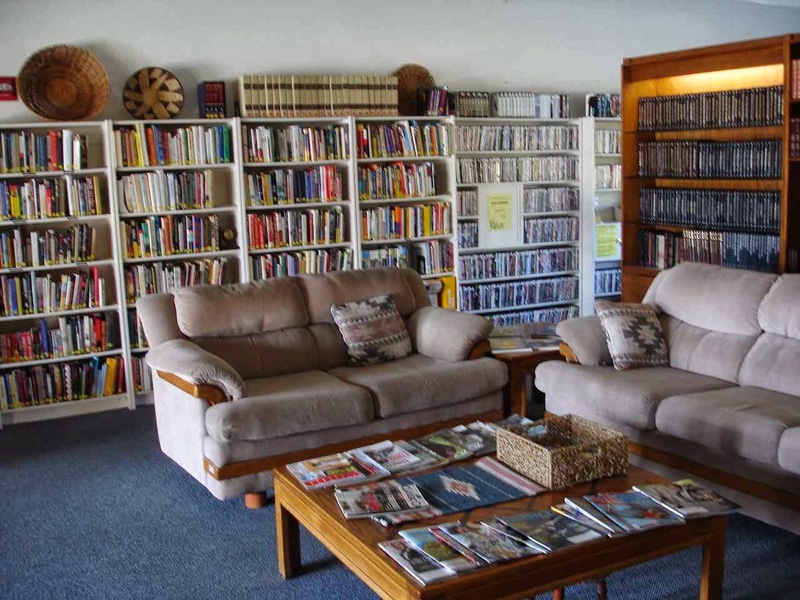 Hundreds of books and dvds in a very comfortable room. Also available are sewing rooms, craft rooms, exercise rooms, card rooms, a big get together hall and kitchen, tennis courts, gardening area, woodworking building, metal building, and car repair building. 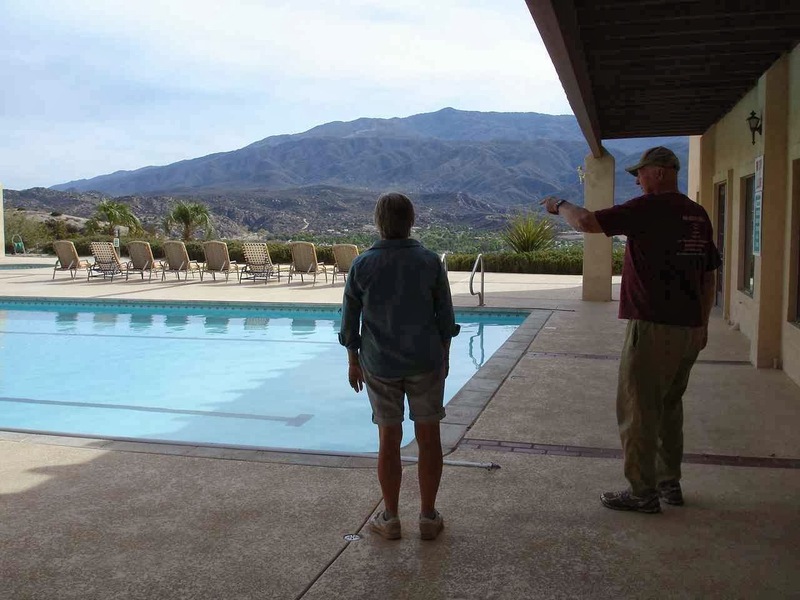 The main building has a wonderful view from the pool area. All areas are well used. The pool, hot tub, and spa are heated. The local flowers are quite happy. 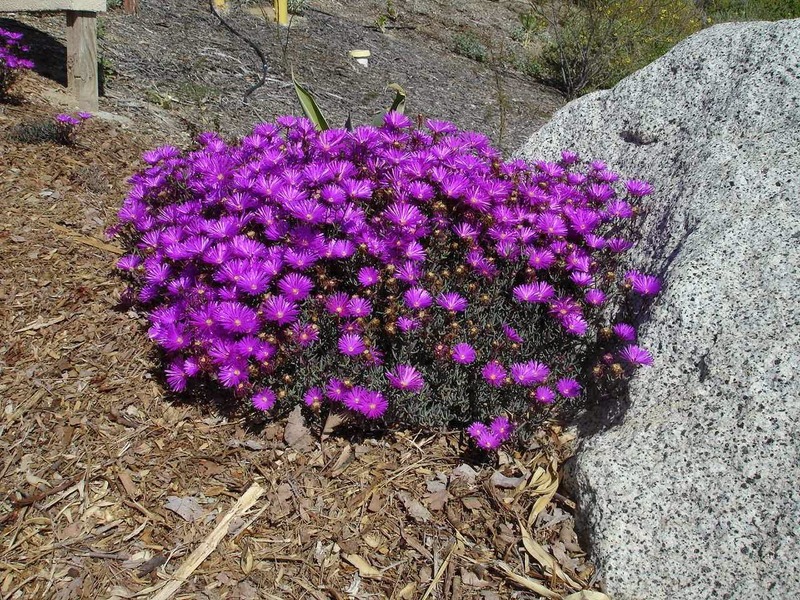 They sometimes have a waxy look which is a way for the plants to conserve moisture. Yes, they are very real. All campers here are member of Escapees. As a coop, they can buy into a space for $30,000. This buy in is returnable if and when they leave. There is a waiting list for the coop spots. 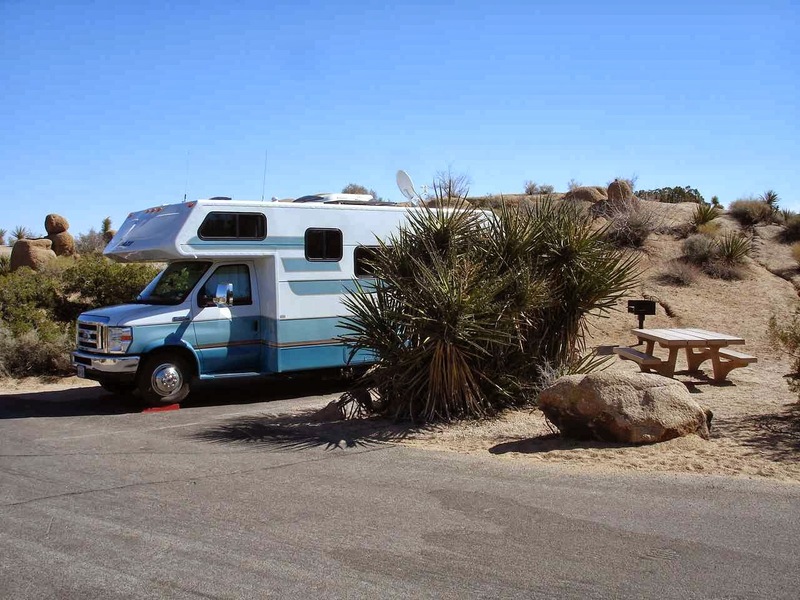 Visitors like us can stay in boondocking( we did) for $5 per night. Or, they can stay in owners sites than have been made available for rent---the owners are away. Owners pay about $253 per month for expenses. Some ponds are quite elaborate. The owners are quite proud of this pond. We loved this park, but it is quite a distance from New England. Who knows? Family and friends can visit! 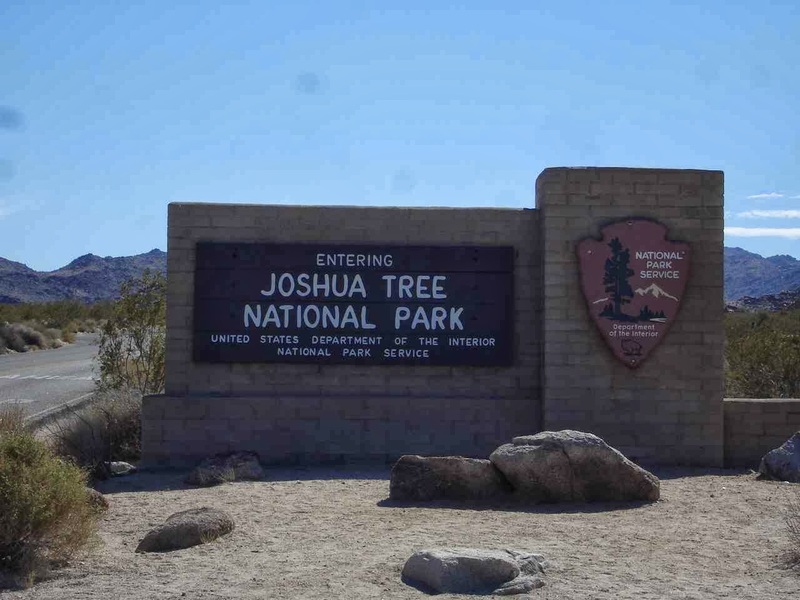 Time to move on to Joshua Tree. 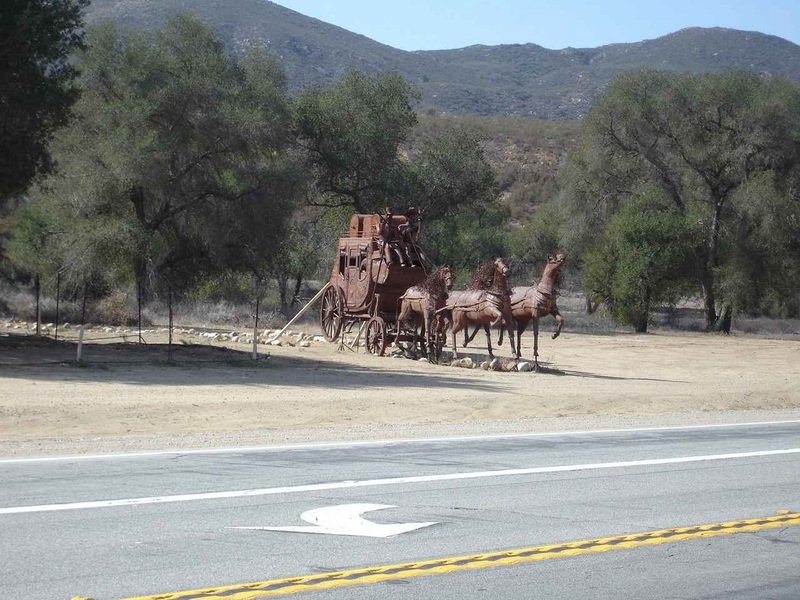 Close to Temecula is this metal sculpture. 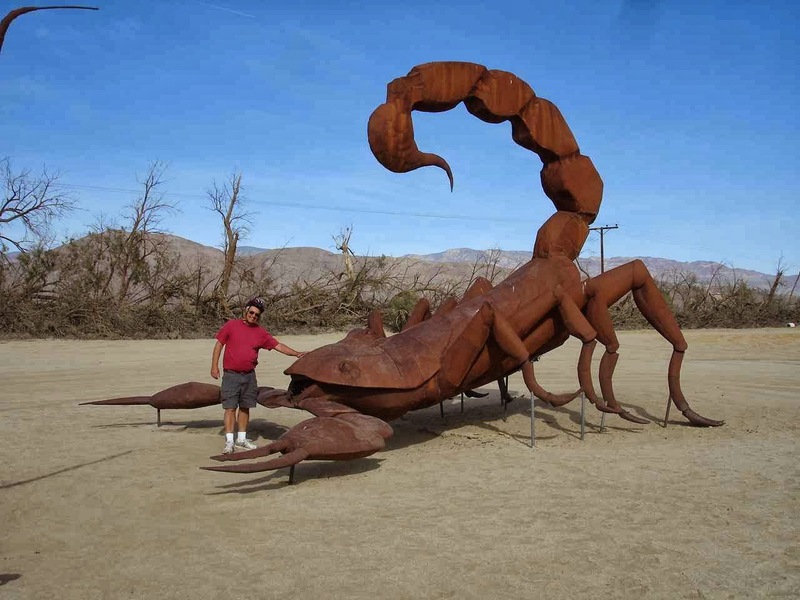 And yes, it is by the same artist as Borrego Springs. His studio is close by. 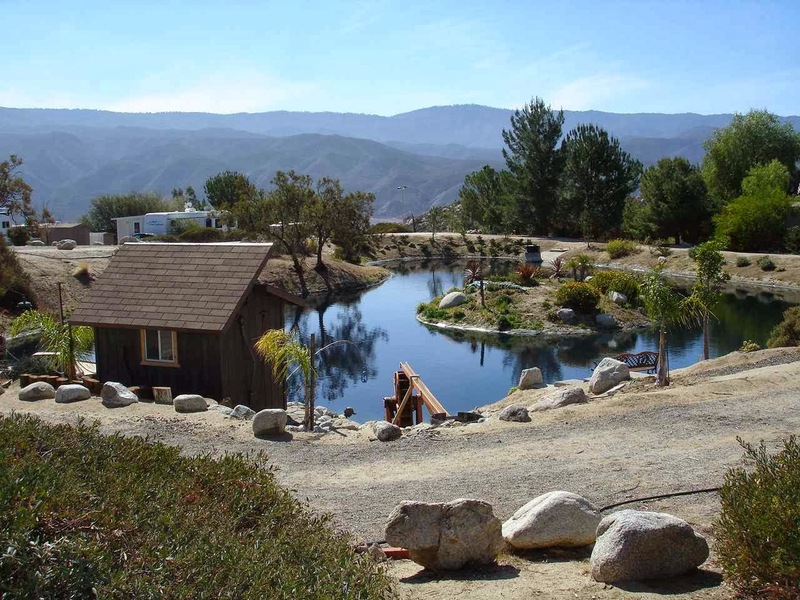 Just a small ranch house on a hill. 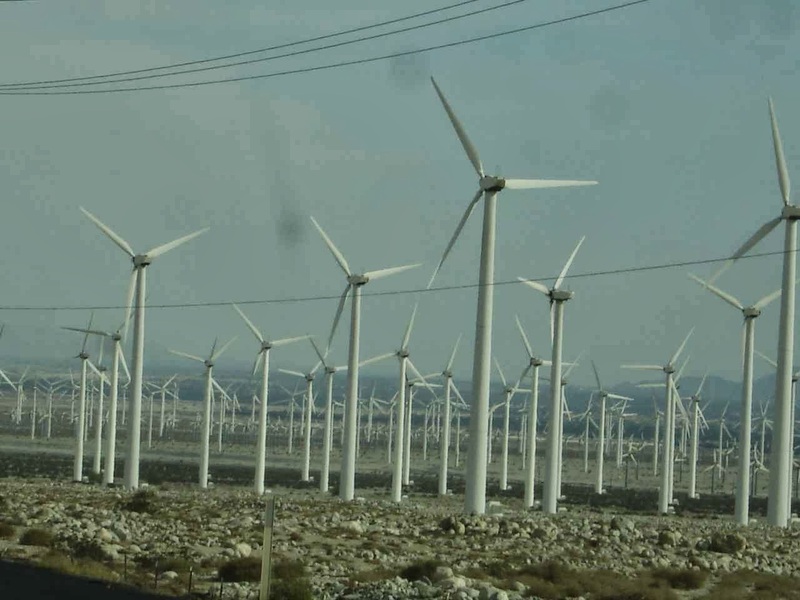 North to Route 10 and Indio, where you see hundreds and hundreds of wind turbines or wind farm. And, what a change. We climb to about 4,000 to 4400 feet elevation. 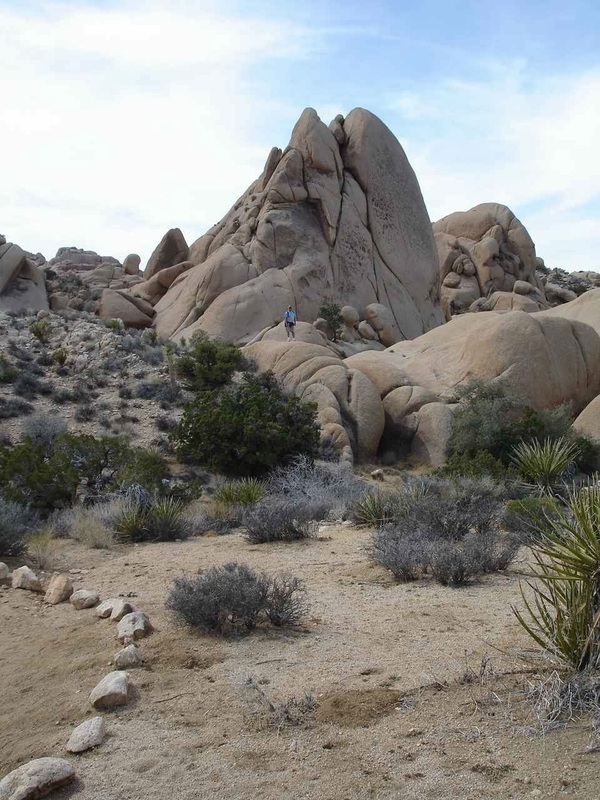 Joshua Tree offers us warm days close to 80 degrees and nights in the 40's. Lady Blue is quite happy. The campground has only pit toilets. There is no fresh water or dump station. We are happy to be self contained, we can easily go 7 days now. However, the weekend brings many tenters, eager to rock climb. 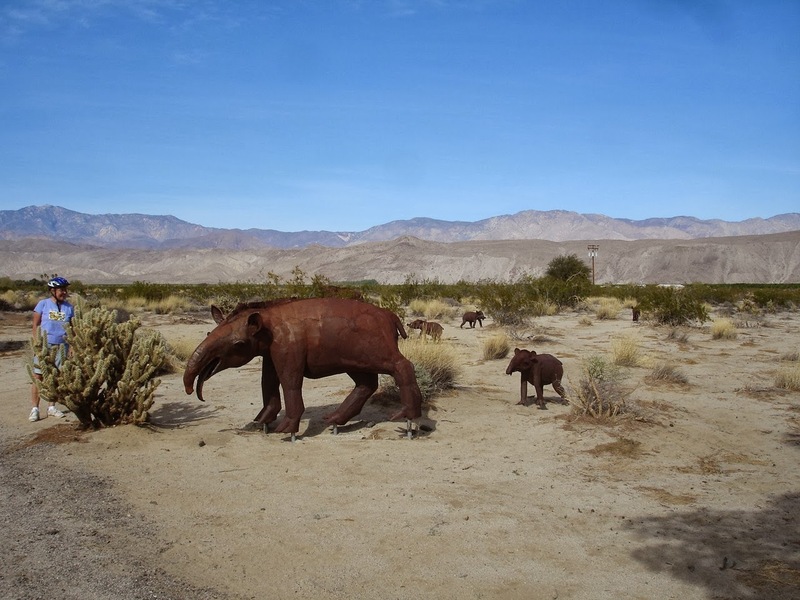 There are many signs of animal life at Joshua Tree. Squirrels and lots of birds. 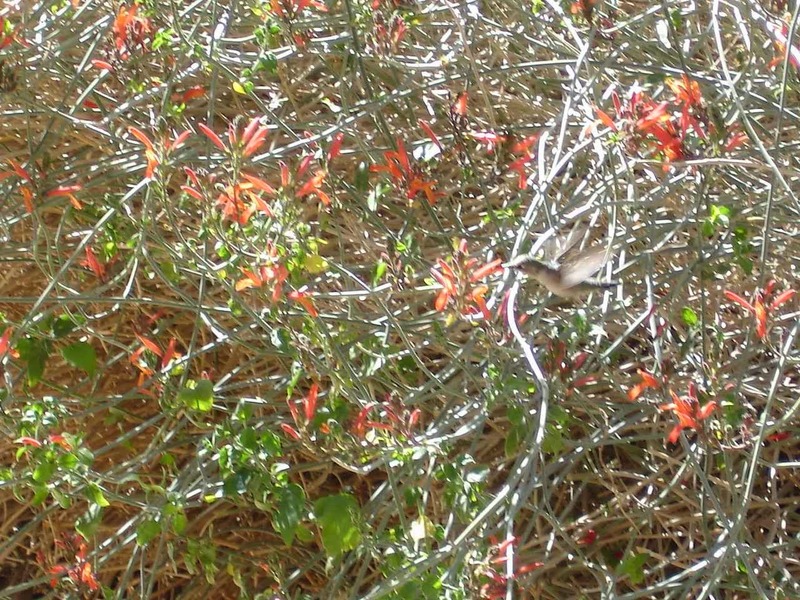 This hummingbird is quite happy with early Spring buds. 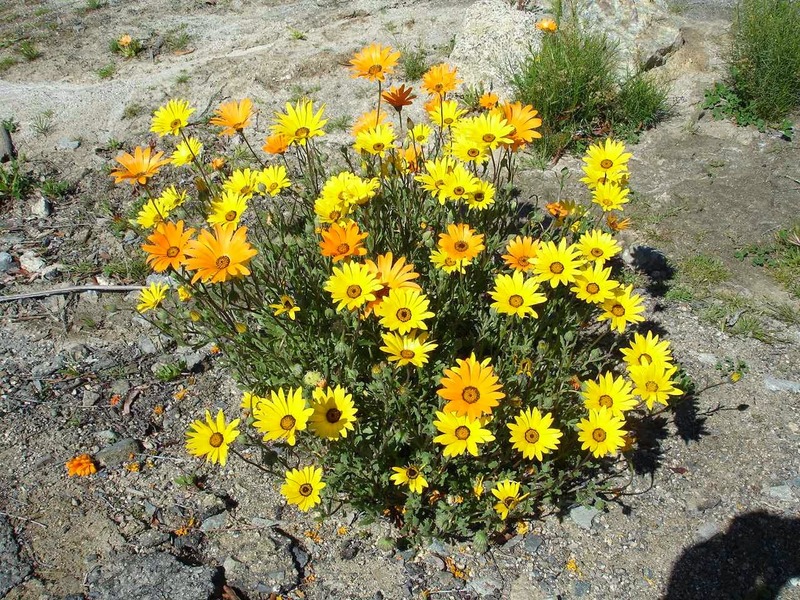 They grow at elevations between 3,000 to 5,000 feet. 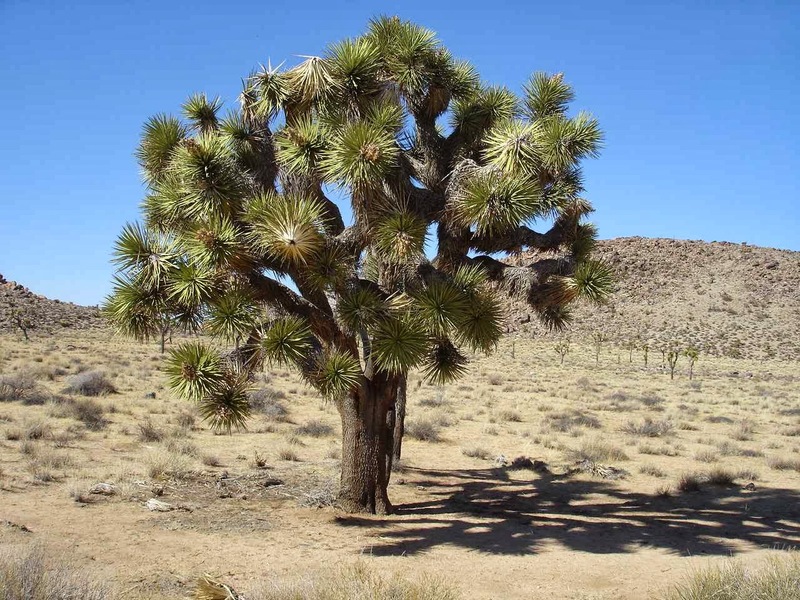 Our campground is at about 4,000 feet and there is a high meadow that has a huge forest of Joshua Trees. They are a member of the Agave family. 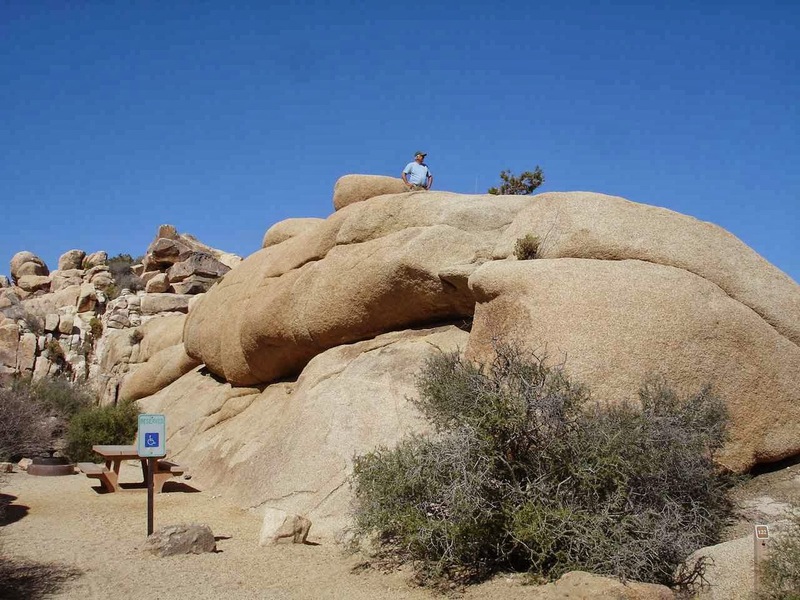 This huge rock formation is a favorite for serious rock climbers. The picture shows different routes up the rock face and the use of climbing gear. Bruce and Jan will skip the serious rock climbing. 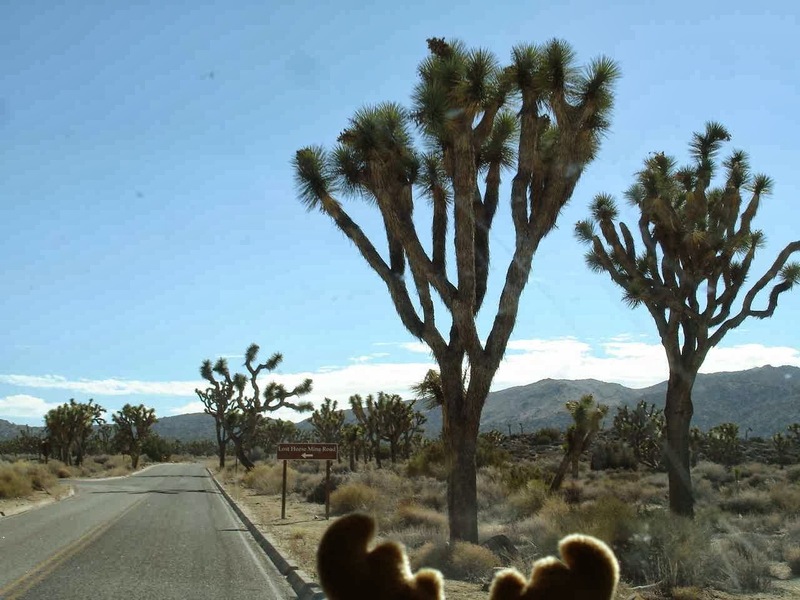 Even Eustis likes the Joshua trees. Bruce and Jan, however, will climb some rocks. Hi Bruce! Careful up there! Kind of like a playground for kids and adults. On the weekend you would see all kinds of people on top of the highest rocks. Do you see the climber on top of the rock? He was very excited, calling back and forth with a partner below. 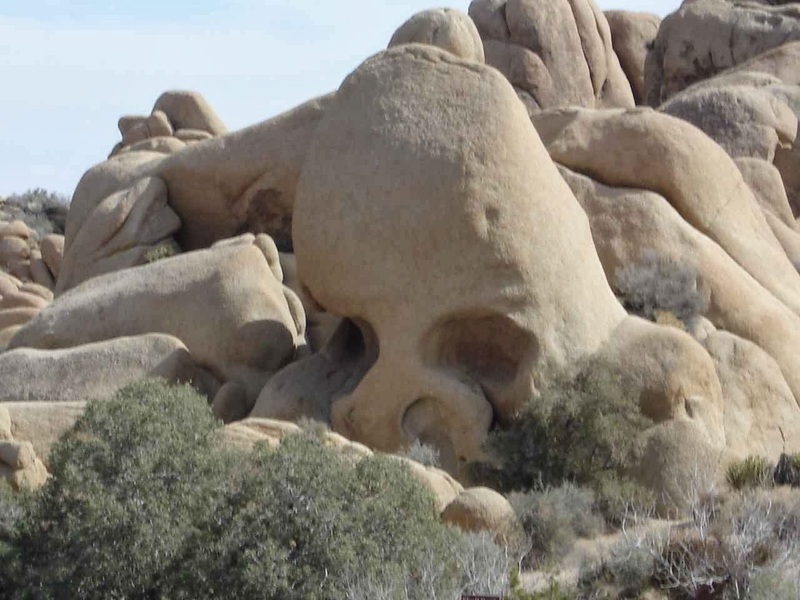 Know what this rock is called? 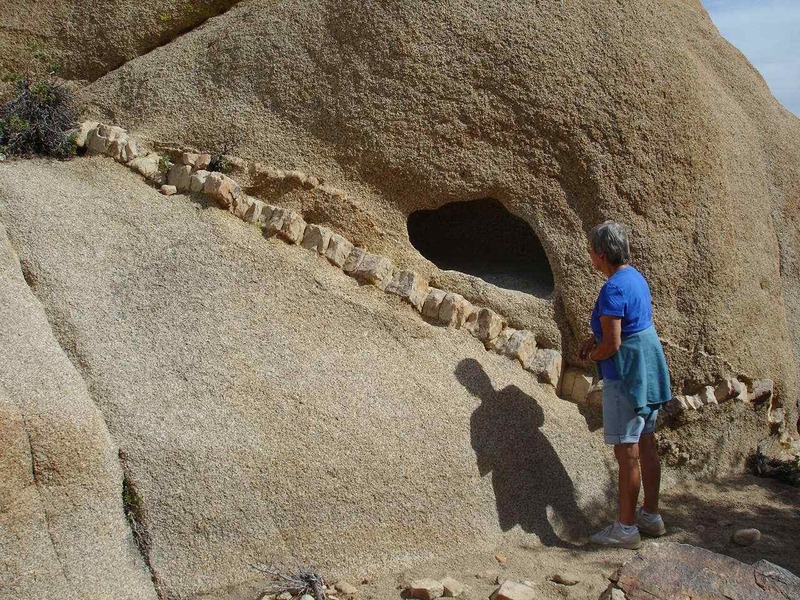 Most formations are a result of granite , being worn away by erosion over thousands of years. Lots of information for geologists. Careful on those rocks Bruce. No, you are not allowed to climb to the very top!!! Now Jan, you can climb higher. Oh yes, the problem as we get older is often coming down, not going up. We are always thinking of Emilie, Madison, and Lucas. They would all love these formations which include all sizes of caves and tunnels. Just keep in mind, Jan, that there are a number of poisonous snakes , scorpions, and other creatures in this area. 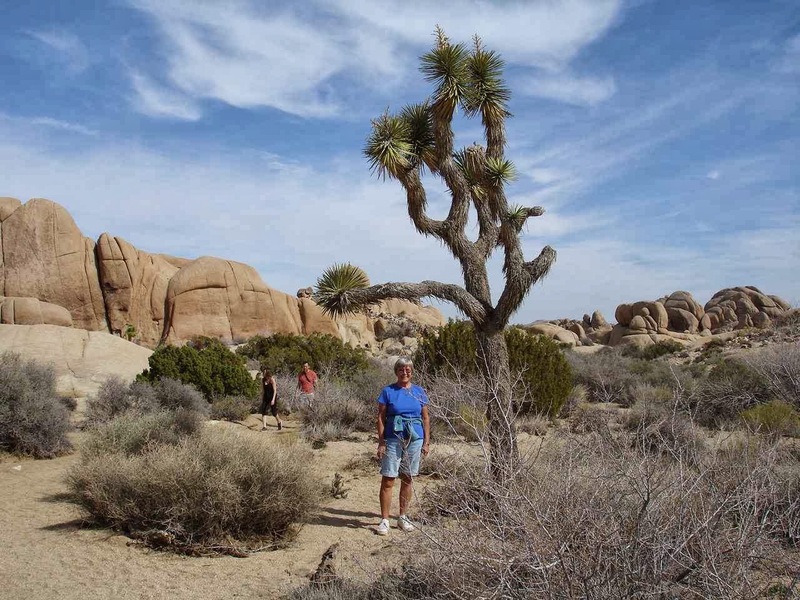 Jan has found her own Joshua tree. Nope, won't fit in Lady Blue. 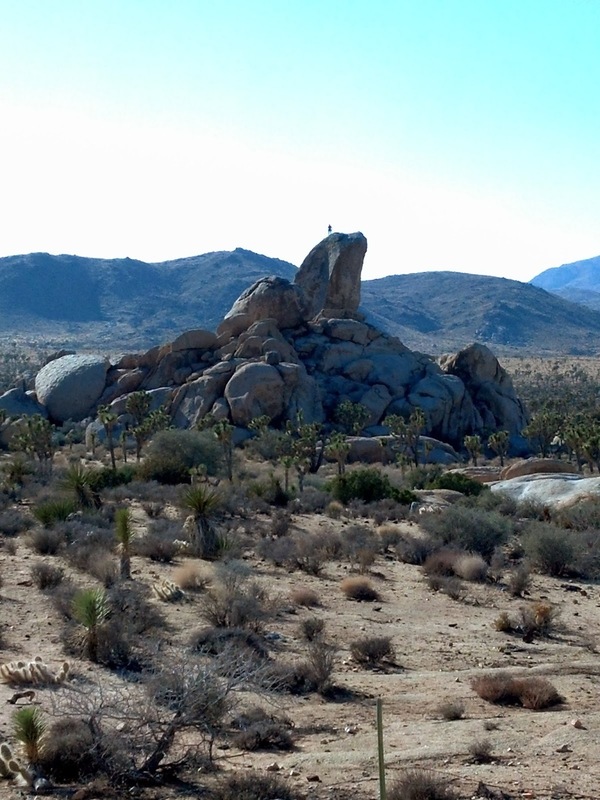 Looking down at our campground , you can understand the name Jumbo Rocks. 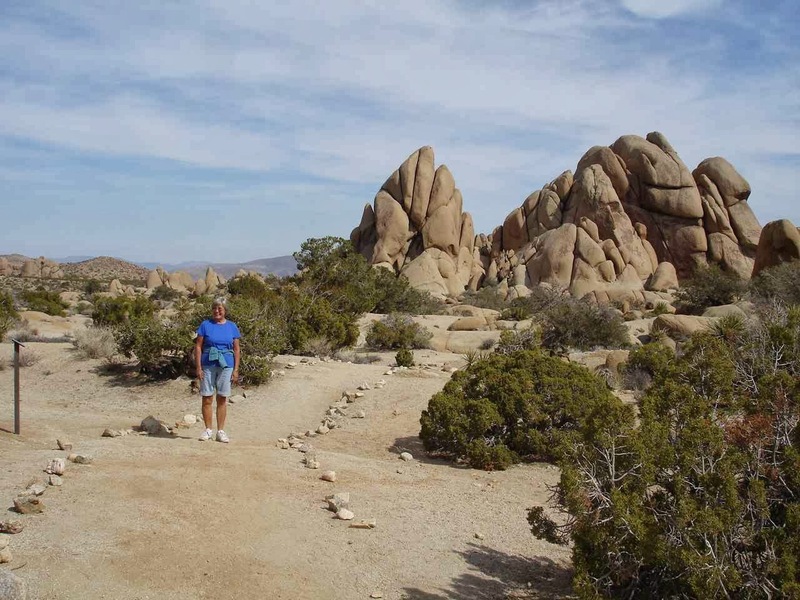 The campsites are well fitted into and around the rocks. 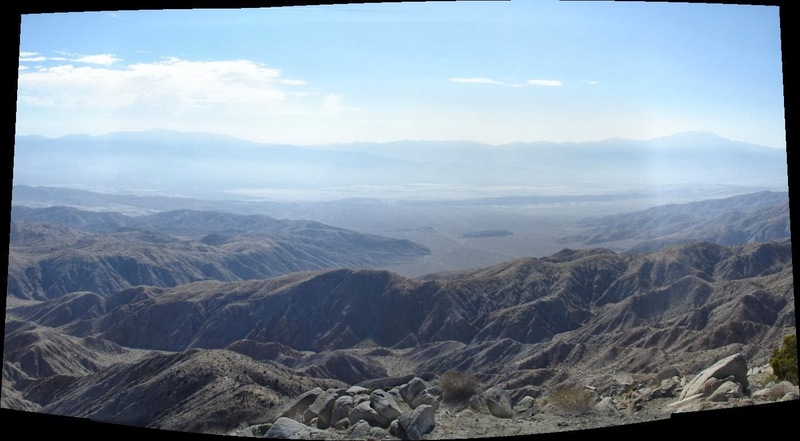 One of our favorite views was from the high point in Joshua Tree called Keys View. The hazy look is from all of the pollution in California, but this was a clearer day than most. We are looking west and the valley rift marks a line of the San Andreas fault. Some note is made of serious earthquakes as recent as the 1990's. This is the view from the back of our Lady Blue. That is the moon in the upper right. 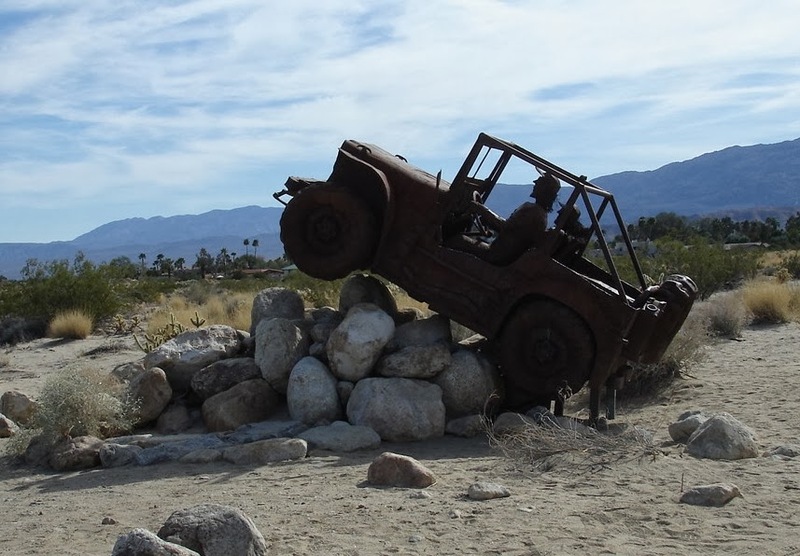 If we were to travel ahead and slightly right, we would come to the Salton Sea. There is no fee for entrance to the visitors center. A wonderful view of the valley from the roof of the visitors center. Down below is Palm Canyon and the state park camping area. The rangers and camp hosts indicated that there had been sightings that day of Big Horn sheep on the trails. But, the chance of seeing them is somewhat hit or miss. The days are warm, so a bike ride is in order. 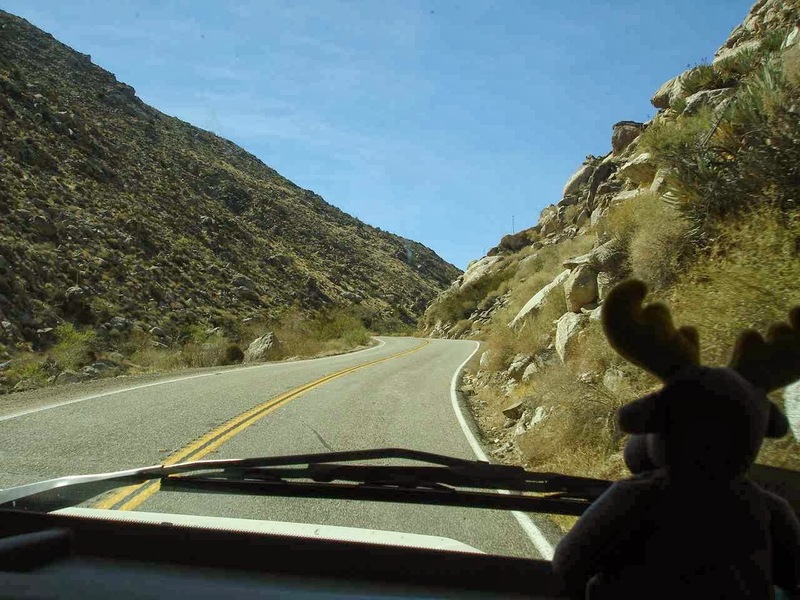 There is a nice ride right out from our boondocking area. Even better, no traffic on this road. 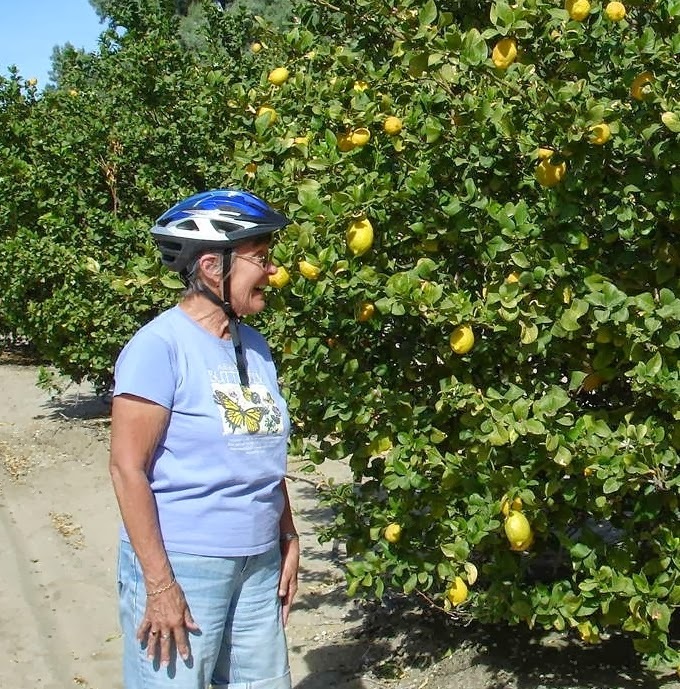 This is how the road looks for a few miles and then, suddenly, we are in a citrus grove and nursery area. 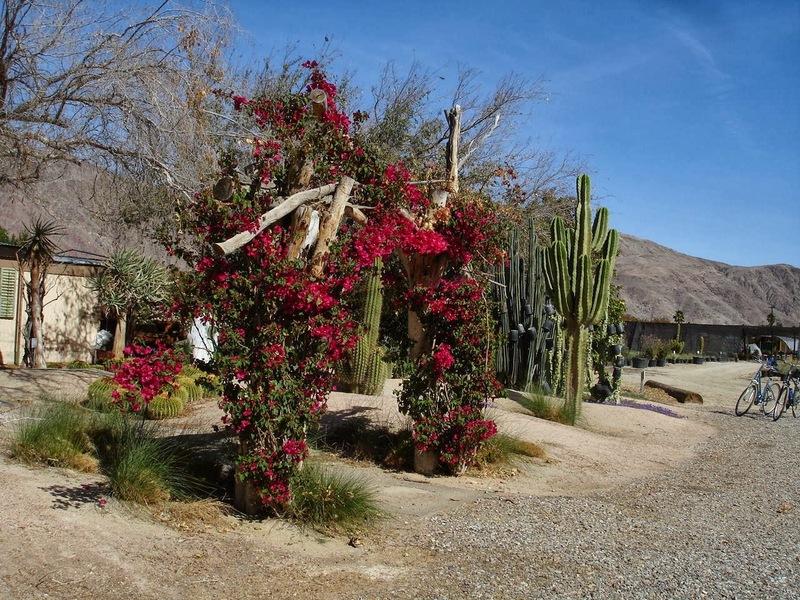 And, of course, in the desert, a nursery would be selling cactus, citrus trees, and palm trees. We didn't see anyone to ask about the caps on the cactus, but we could guess it was to protect the blossom buds? 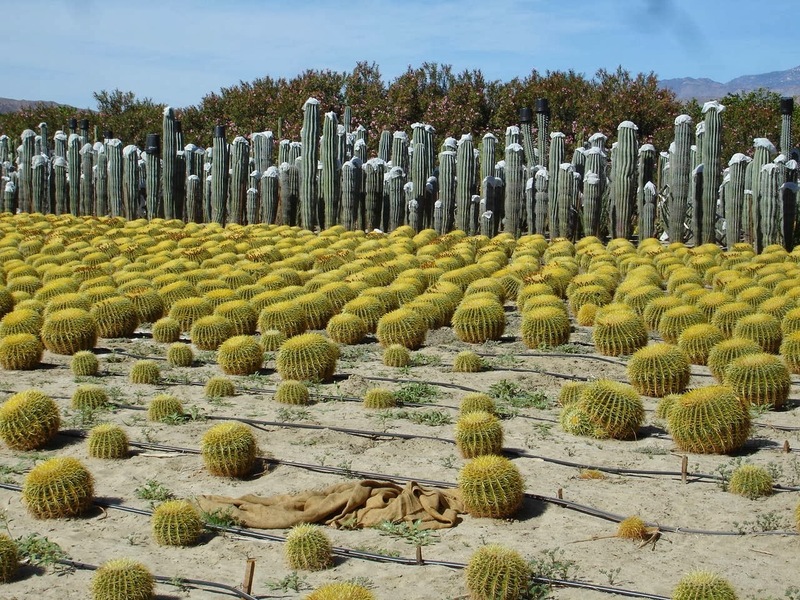 The front seem to be a kind of barrel cactus and the back look like saguaro cactus( it takes as much as 50 to 80 years for a saguaro to grow arms). Some plants are beginning to blossom. 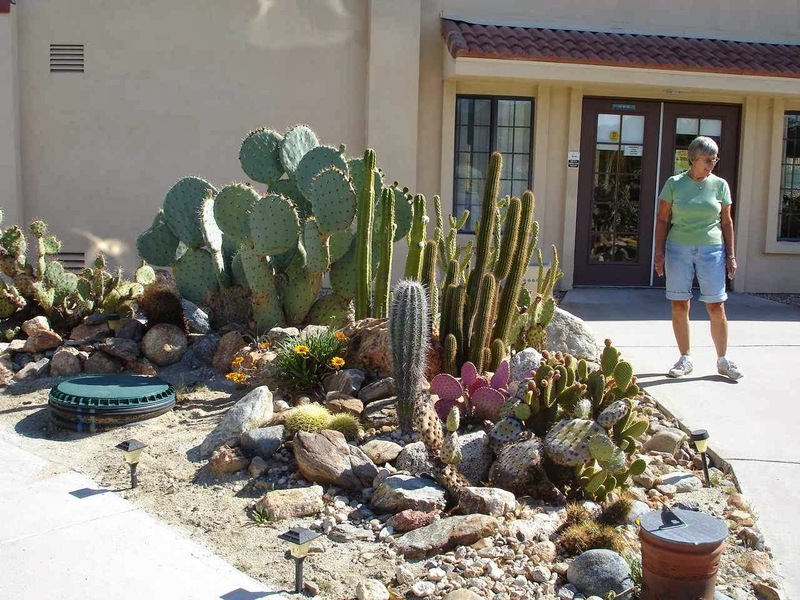 This arbor and cactus are in front of the nursery office. 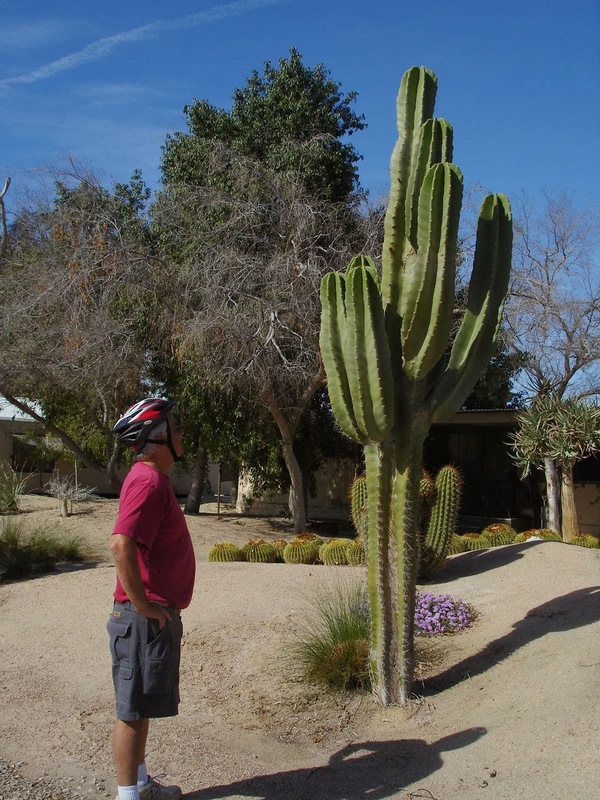 If this saguaro were out in the desert, you would expect that it would be taller with all those arms. You would also expect to see all kinds of bird nest holes, etc, because the saguaro provides food and lodging for a lot of nature. We had headed into this grove because they had advertised oranges for sale. Just going in the driveway, we realized that there were thousands of cirtus trees as well as the nursery plants. Even though it is a little early, we stopped short at one spot because there was a strong scent of lemon blossoms. 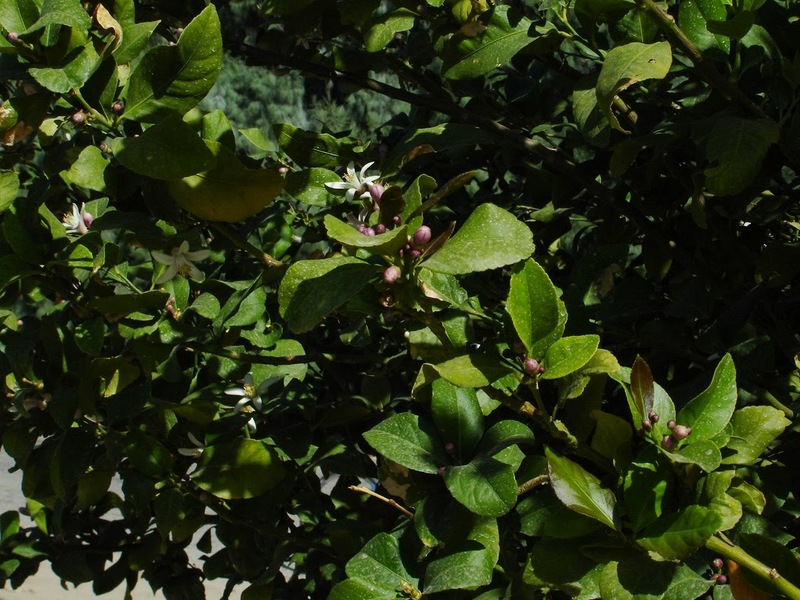 "Lemon tree very pretty and the lemon flower is--------SWEET!!" As you can see, these lemons are also rather large. These are some of those lemon blossoms. Pink and then white when opened. A little closer look at the lemon blossoms. 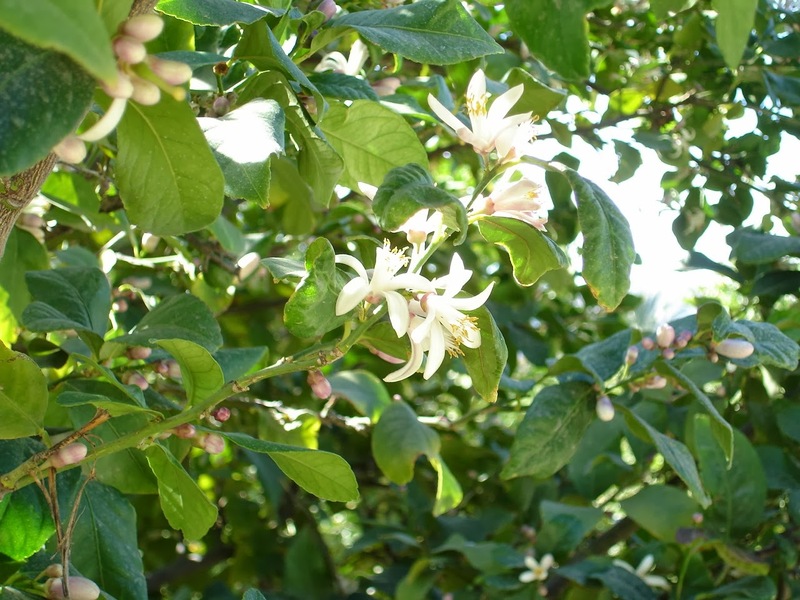 In another month you would be overwhelmed by the strong smell of orange and lemon blossoms. 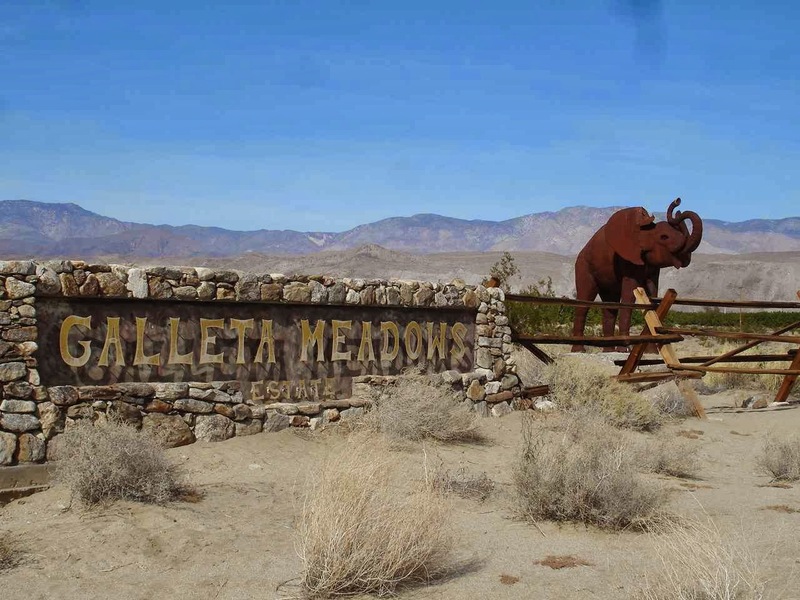 On our bike ride, we can see most of the metal sculptures that are part of Galleta Meadows. These are part of the property of the late Dennis S. Avery. 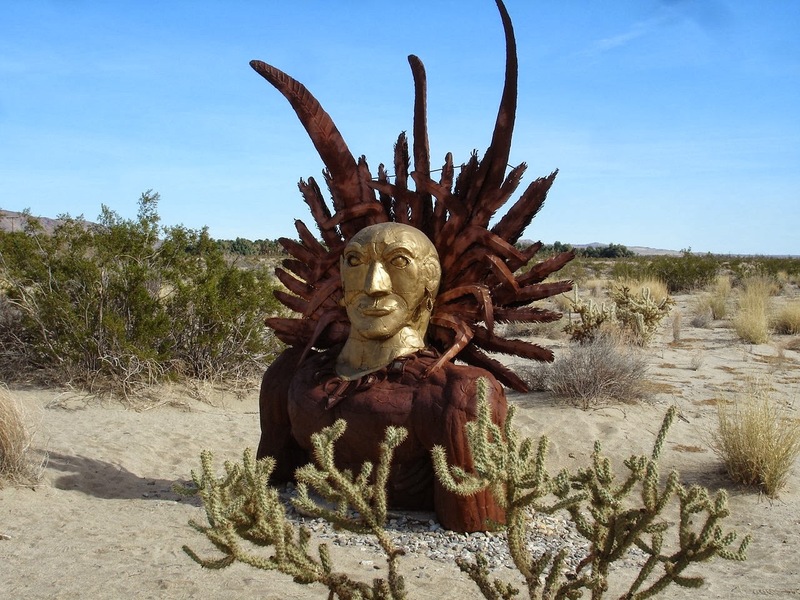 The sculptures are spread over many acres just outside of town. If you click on the "home" page of the Galleta Meadows website above, you will first see a picture of Dennis Avery and his recent (2012) obituary page with a picture of his friend Stephen Hawkings. Avery was heir to the Avery(of Avery labels which many of us have used over the years)fortune. 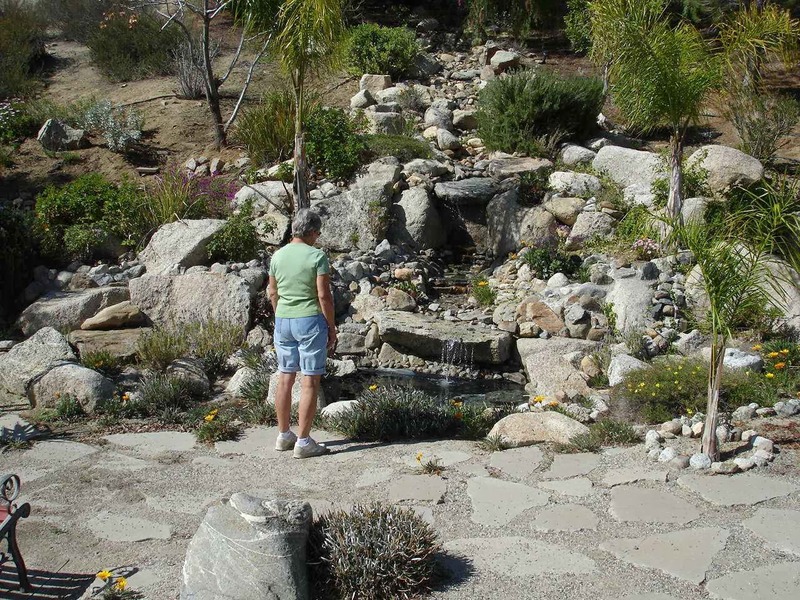 He used his fortune for philanthropic ventures which also included the cosmology center for his friend Stephen Hawkings , support of the ChineseAmerican culture in San Diego, and the sculpture garden here. 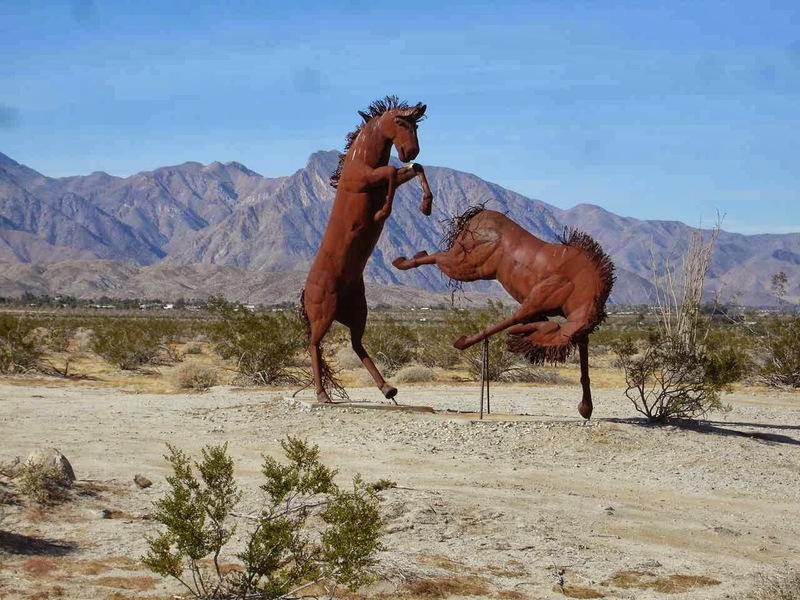 These sculptures are all super. This jeep looks great from a distance, but it is also wonderful in its detail up close. 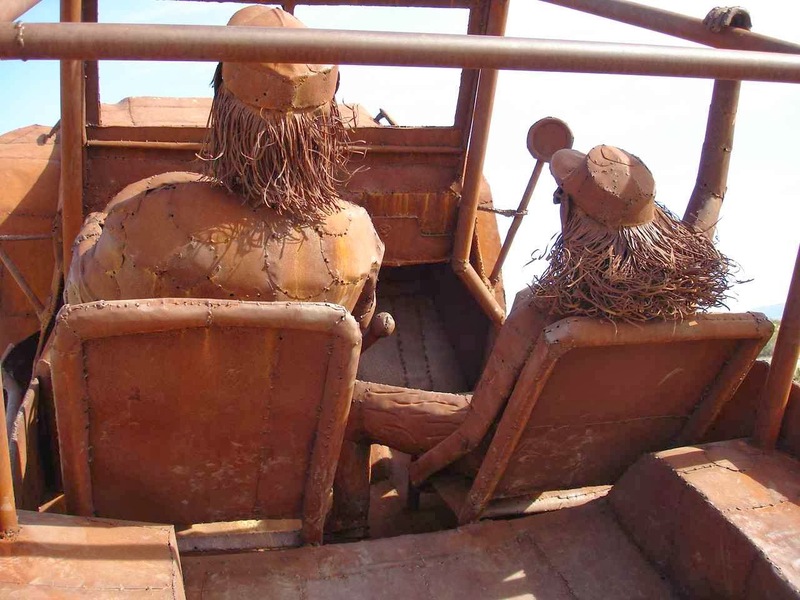 The web address above takes you to a page on Desert USA about Ricardo Breceda, the artist. 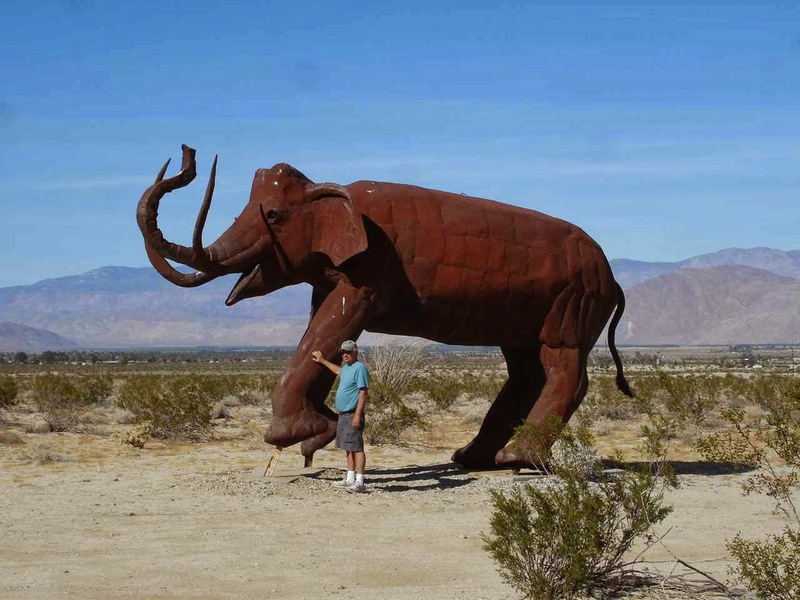 There are 129 metal sculptures all around Borrego Springs. The details for the hair, the clothes, the interior, especially the realistic cracks in the leather are fascinating. Galleta Meadows is the name of Avery's estate. The serpent was completed in 2011 and is 350 feet long! Do you see the person walking behind the middle section? 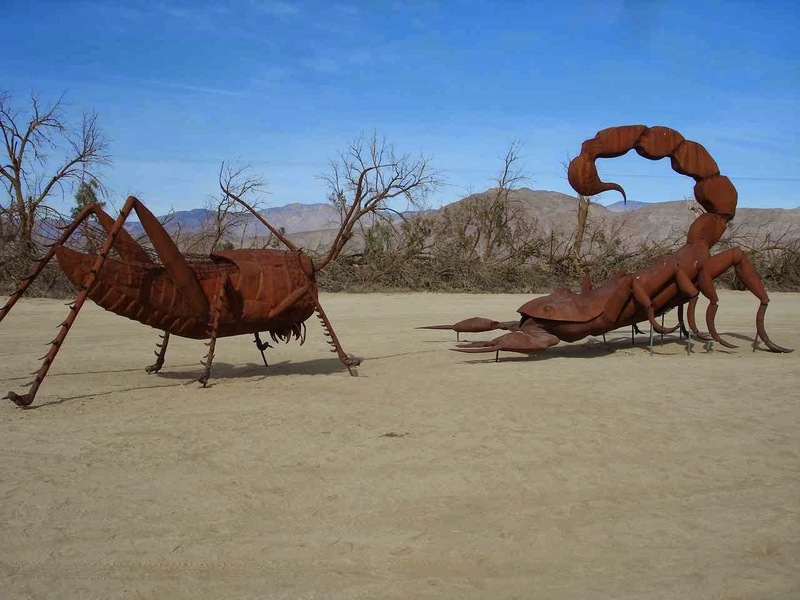 So realistic, the grasshopper and scorpion. Just to give you an idea of the size of some of the sculptures. The sculptures are so lifelike. It seems perfect to have these spaced out in the desert with the mountains in the background. The effect in a museum would be be very much diminished. What do you think? Mom/Grandma could have worked the Big Top, right? 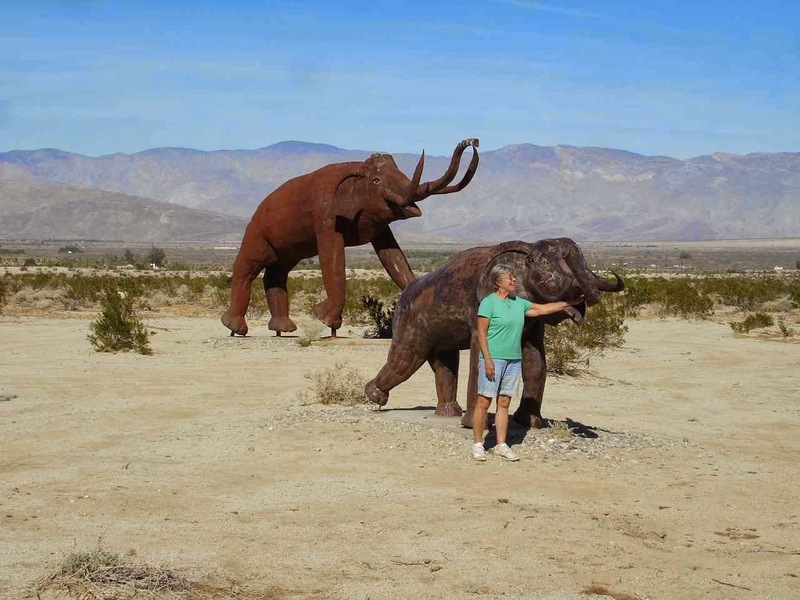 If this elephant were real, Bruce would be about as far away as those mountains!!!!! This was the perfect day to bike around. On towards the weekend we were thinking of all the New Englanders still shoveling out from a snow storm and awaiting another one on Saturday. Here, we had to hunker down on Saturday while the temperatures soared towards 100 degrees(we reached about 97). It's a dry heat though and still preferable to single digits, snow, and ice. Today, Sunday, is back in the middle to high 80's. Think the same proportions as the other sculptures. Jan and I would only come up to about the top part of the nest. 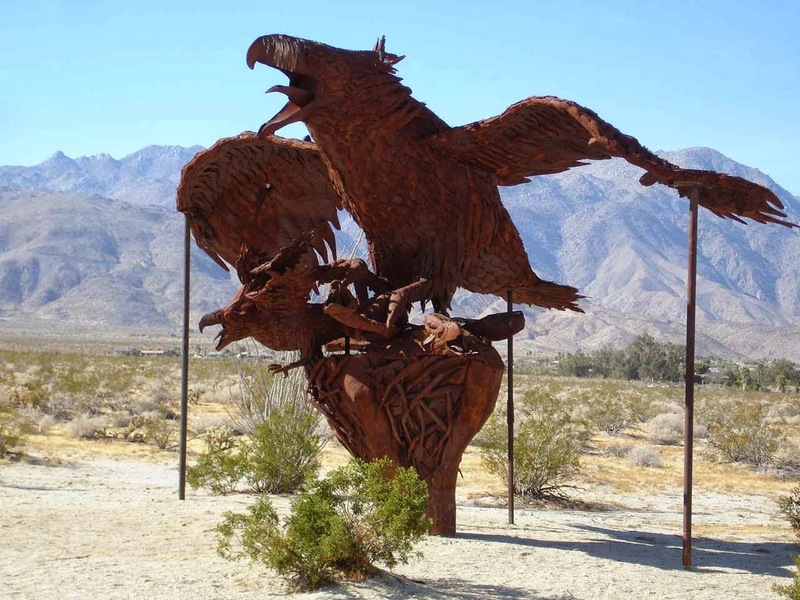 Some people think of this eagles' nest as the best of the sculptures. They really love the detail on the feathers.